Our team and clients help with the Holyhead port disaster clean up. Following the marine disaster due to Storm Emma, which sent polystyrene drifting all along the Anglesey coastline and further afield, our team and clients spent some time helping to clean up. Alarmingly there was a LOT of fishing line and tackle found as well as the polystyrene and lots of plastic bottles. 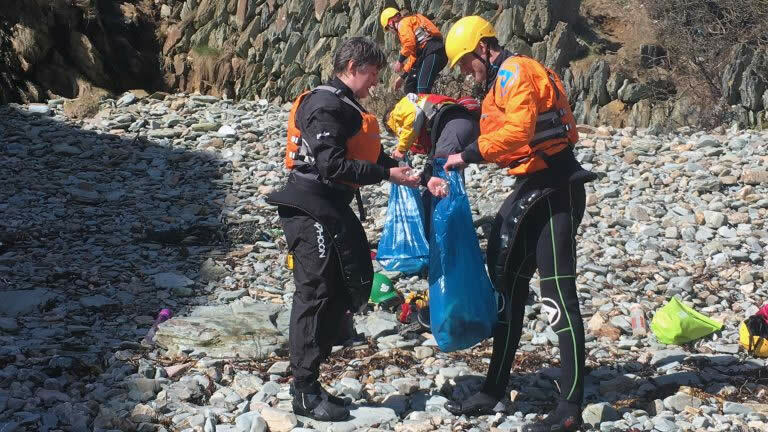 In just 15 minutes of beach cleaning we filled 4 kayak hatches full of rubbish from the beach near Rhoscolyn head on our staff training paddle and a similar amount was collected on our introduction to kayaking courses on the small beach due west of Porth Dafarch. Do you bit, pick up three pieces whenever you visit the beach!